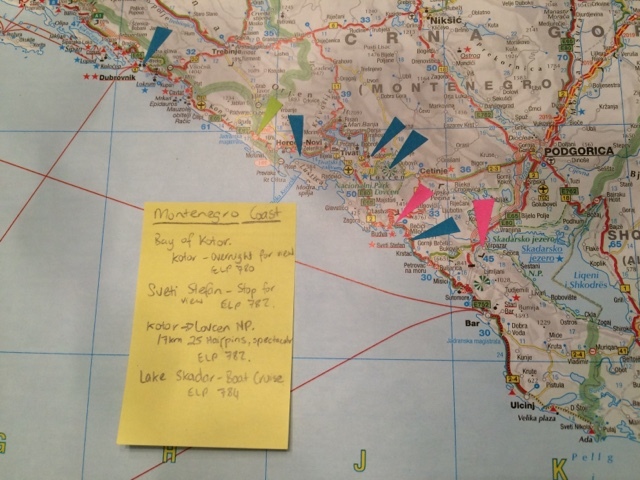 When it comes to planning, we like a paper map in front of us. Once we know where we are intending to travel to then we like to ask the GPS to guide us. It's easy to read all the various tourist guides and 'oh, I want to go there and there and there', more difficult (on a big trip) to remember all those points that we hoped to visit. But I have a system. I do my planning with a variety of research methods: guide books, websites, free PDF booklets downloaded from official tourism board websites. But I need to put all the sights in order so that we don't drive past them without remembering to stop, and so that we do them in a logical order. 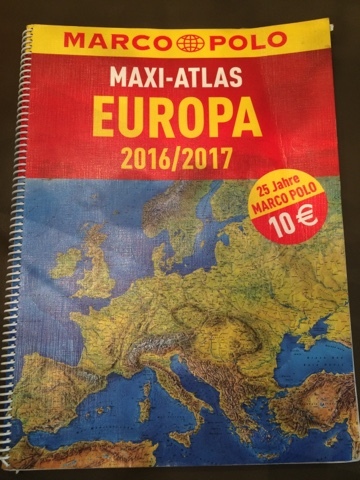 At a European gas station we bought a great map book. We bought it in Germany for €10, but I've seen it in other European gas stations and I'd buy it again for more money if I lost this one. It's good because a) it's got all of Europe, b) it has plenty of detail, c) it's a large size and d) it's international (the legend is in 28 languages). With this atlas I plan. I cut 'post-it' note stickers into little arrows and I mark points on the map. Different colours have different meanings (attraction importance, scenic route, campsite), and I make notes on a note sized 'post-it' and attach it to the page. The notes remind me what's at the arrow and where I have more info. Here's a sample. Some people might find this fiddling, but it's working for me.